It seems Beyerdynamic didn't get the memo that analog jacks are out and wireless streaming and Lightning ports are in. The company's $599 Amiron home headphones tether you to your choice of musical source and practically insist that you stay put and take your music seriously. And thank goodness for that. Instead of producing a mediocre pair of headphones following the latest trend, Beyerdynamic has delivered an astoundingly great-sounding headphone that’s sure to please anyone who cares about playing their music with the energy and dynamics of the original performance. In 1924 in Germany, Beyerdynamic’s founder Eugene Beyer started making loudspeakers for movie palaces (aka theaters) during the transition from silent to talking films. In 1937, the company began production of the first dynamic headphones, the DT 48 (which remained in production until 2012) and hasn’t looked back since. The Amiron home follows in that tradition and is the successor to the company’s model T90. The Amiron home are an open-back, circumaural design with an impedance of 250 ohms, making them easy to drive with today’s mobile devices. The claimed frequency response for these dynamic driver headphones is an astounding 5Hz to 40kHz. Those aren't just some numbers on a spec sheet, these headphones delivered some of the best and authoritatively clean bass I’ve heard out of a headphone priced less than $1,000. Don’t look for Bluetooth. These are strictly wired headphones. And what a wire it is. The included 3.0-meter, rubber-coated cable is perfect for plugging into a home headphone amp or computer and reclining in your favorite chair. But its thickness and length render it awkward to walk with or to bring with you on the road. I had to curl it around my neck like a shawl if I wanted to walk around the house with the headphones. You can order a shorter, 1.4-meter cable directly from Beyerdynamic, but that will set you back $105. Beyerdynamic's logo is printed on the top of the wide headband. The Amiron home are headphone amp friendly too. The included cable has a threaded collar that will accommodate the included 1/4-inch adapter, which has a threaded female receptacle so that you get a good, tight fit. The headband and ear cups are plush even though there’s no leather. They are made of soft Alcantara microfiber and microvelour. I cringed a bit when I saw this. Many velour-style ear pads make my ears hot and sweaty. The Amiron home's cable is terminated with a 3.5mm plug, which has a threaded collar to accommodate the included 1/4-inch plug adapter. Beyerdynamic says that the ear pad materials have temperature-balancing and moisture-regulating effects. Whatever tech Beyerdynamic used worked surprisingly well throughout my review period. Even after hours of listening, my ears weren’t sweating a bit; and since the cans weigh in at just 340 grams and apply minimal compression, I hardly noticed I was wearing headphones at all. The Amiron home are unapologetically audiophile headphones. The ear cups are so large that dance along the borders of your cheeks. That cavernous expanse pays off in spades with a deep and spacious soundstage that more closely resembles the sensation of free-standing speakers. The Amiron home's ear cups are audiophile-sized. For comparison, you can see they are significantly larger than the Meze 99 Classic over-the-ear headphone ear cups. Just be aware that those big ear cups don’t fold, so the carrying case is huge. If you want to take these cans outside your house, assume you’ll be slipping them into a backpack or suitcase. Beyerdyanmic’s Tesla technology lies at the heart of the Amiron home. Named after the famous engineer and physicist, Nikola Tesla, Beyerdynamic says the eponymous tech brings a powerful magnetic drive, clean reproduction, and low total harmonic distortion that enhance the performance of the headphones. Previously, neodymium magnets lay at the heart of the company’s dynamic headphone system. Now the magnet is mounted as a ring that encircles the coil. Beyerdynamic says this allows the headphone to provide more energy to the membrane. The sonic benefit? Rich detail and greater dynamics. I don’t quite know how Beyerdynamic has done it, but after many weeks of listening I couldn’t agree more. The ear cups are made of Alcantara microfiber and a microvelour. Suprisingly, the material doesn't make your ears and head sweat profusely after long listening sessions. I used the Amiron home headphones for more than a month with a variety of source devices, including Astell&Kern’s AK70 and Pioneer’s XDP-100R hi-res music players; an iPhone 7 and a MacBook Pro; and an Anthem AVM 60 using the pre-processor’s headphone amplifier. I played mostly high-res FLAC, ALAC, and DSD files as well as some lossy AAC files downloaded from iTunes or from Apple Music. Make no mistake, these are incredibly musical headphones in just about every sense of the word. I was smitten from the first notes that emanated through the Amiron home, and I think you will be too. The Amiron home have a few distinct sonic characteristics. First, these have a bit of a relaxed presentation, while other headphones tend to be more intimate and forward. If you don't like a relaxed presentation, then the Amiron home's sonic signature might not appeal to you. The Amiron home's metal headband is light and incredibly flexible, making them virtually disappear once on your head. Here, I am able to bend the headband significantly and position the ear cups one next to the other. Second, the soundstage explodes deep and wide as soon as you put them on. The 24-bit/96kHz FLAC version the Chesky recording of Tchaikovsky's "Waltz of the Flowers" from the Nutcracker is a good example. The harp is beautifully recessed with the varied horns and strings layered into the soundstage. The 24-bit/176.4kHz version of “Spanish Harlem,” by Rebecca Pidgeon, was magnificently layered with Rebecca's vocals forward and the piano and other accompanying instruments situated farther in the background. 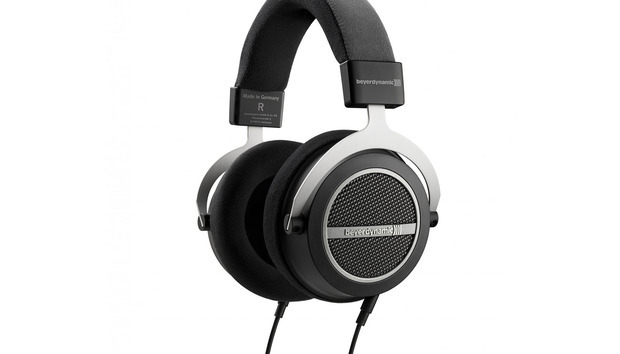 Third, the ability for the Beyerdynamic to bring out details and resolve complex musical layers was a marvel. You don’t typically get this kind of detail in a dynamic headphone at this price-point. While listening to Adele’s “Rolling in the Deep” I could clearly and distinctly make out every backup vocalist and hear exactly what they were saying—down to the last syllable—every time. All the while, Adele's vocals were placed at front with pitch-perfect clarity. Slow it down to the 24-bit FLAC version of the Beatles Abbey Road and you'll be amazed by the Beyerdynamic's ability to bring the legendary album to life. The Amiron home played "Here Comes the Sun" with timbral accuracy, airy highs, and an open midrange. Fourth, the bass is beautiful and its extension and control are just downright uncanny from an open-back design. At times—if not every time—it was like the bass was coming from a high-end sub. You’ll hear and feel new-found sounds you never knew existed in tracks you've listened to dozens of times. The heartbeat on the opening of Pink Floyd’s “Speak to Me” from Dark Side of the Moon pulsated with clarity and dynamism with the attack of each beat starting and stopping on a dime. The deep, synthesizer bass lines on Sarah McLachlan's “Perfect Girl” from Afterglow Live, Bonnie McKee’s “Trouble,” and Lorde’s “Royals” were remarkable test tracks. Detail of the left headband, which contains the headphone's serial number. The Amiron home’s one-two-punch of deep bass and lightning-fast transient response made percussion instruments pop and snap with the kind of realism you get from live music instead of those polite thuds that are all too common. In fact, the Amiron home rendered Sade’s “Soldier of Love” with the best musical energy and clarity I’ve ever heard from a pair of headphones. Beyerdynamic wanted a headphone that can bring audiophile sound to today's mobile devices, and they succeeded. The Amiron home sounded superb with every source I used—including the iPhone 7 and Macbook Pro. But, if you really want to see these headphones shine to their full potential, plug them into a dedicated headphone amp and then sit back, relax, and enjoy the music. There was an odd anomaly when I paired the Amiron home with the Anthem AVM 60, however; bass energy became too intense to the point where it produced resonances within the ear cup. I never experienced this with any other device—only the Anthem. The Amiron home is an open-back design, which means that the ear cup allows you to hear your surroundings. Open back headphones tend to have a more spacious and deeper soundstage versus closed-back designs. Beyerdynamic's Amiron home dynamic headphones don't have Bluetooth, active noise cancellation, a gesture pad, or even an inline microphone. And you know what? I couldn't care less. What the Amiron home lacks in high tech it makes up with stunningly beautiful and dynamic music reproduction from the deepest bass notes to airy highs without ever becoming fatiguing. If you care about getting lost in the music again and again, night after night, you need to check out these cans. Highly recommended.